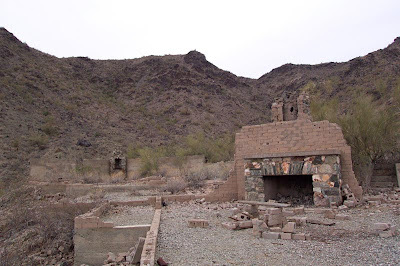 South Mountain History: Ruins - Resort or Mining? This fireplace is too fancy to be a mining structure, although there are some small mine workings to the east on the hillsides, and old trails up the ridgeline (see the 1942 map also). Supposedly there was some rusted mining equipment in the area southeast of the ruins there once but by the mid-90's when i explored here, it was gone, as development crept westward. It was said some years ago that there was to have been a trailhead in this area to access the National Trail, but the City failed to act before the developers covered the access routes with expensive houses. Too little, too late! There is an old trail that continues past the ruins to the north that leads to a mine/adit. It is overgrown and hard to follow, but quite facinating. I have tried to find more information about this site but have not been successful. There is, however an access to the trail at 17th avenue. It is just a drainage spot, but it is open to the public. Park on a side street and check it out. Marty Gibson wrote an interesting article about this site in the Ahwatukee Foothills News of December 5, 2008. It's on page 6. They have electronic versions of the paper at ahwatukee.com. The park rangers call it the Lost Ranch, and Marty's sources think it may have been a speakeasy during Prohibition. 'All in all, it probably was a pretty fancy place, for an Arizona mining building that is. My theory is that the mine was never profitable, and the whole thing was a scheme to take in investor money. The mine is easy to get to from Phoenix (maybe a little over an hour from Union Depot by Model A) and has a couple of deep shafts and a nice building. All you needed was an ounce of the real stuff and a shotgun to seed the mine and really impress deep-pocket visitors from back East. This is idle speculation on my part, of course'. He may be right, since other information says little ever was taken out of the South Mountains, except for maybe the Max Delta mine below the north side of Goat Hill. One could probably go down to the Arizona Department of Mines to confirm this information. You may have to get in line behind the out of state people who bought a claim to a mine on Ebay though! Did you ever find out about this ruins? I could not find the artical from Marty Gibson on ahwatukee.com. If this is the location I think it is, I've seen it from the top of the mountain, on horseback. From there it appears to be just a slab of concrete with a dirt road approach. The masonry work is very good and would probably be a bit much for a mining camp. The blocks have the look of adobe but as you can see they are hollow which probably means slump block. Slump block was one of the more expensive choices of building materials and was popluar in the 50's and early 60's. If my orientation is right this shot faces roughly north and there appears to be a stairway to a patio structure, again a bit much for miners. I've been told by several sources that it was a nudist resort for the Hollywood types. The concrete outpads were private bungalows. It was a failed venture at any rate and my guess would be that few came because it was near the nowhere town of Phoenix and because the diffulty getting there during the timeframe of the 40's or 50's. This is all I got. Hope it helps. Lots of old gold mines on South Mountain. A fenced in one is at the end of 19th ave behind the steak house there! Driving in the Park look for huge tailing piles and there are like 3 mines there as soon as you go in past the rangers checkpoint look straight ahead and a little to the right. It is NOT the Max Delta mine. The Max Delta mine is a very well known mine on the other side of the mountain. The "lost ranch" area southwest of Max Delta by about 2 miles on the south facing slope. Max Delta is on the north facing slope. Looks like too much concrete and stone work for a mine. I have seen a few mines and the foundations of the living quarters are rarely places money is spent. Too bad its gotten the press lately as the "taggers" have found it with their spray cans. Very sad that a bunch of punks have decided to vandalize the property. Love this trail though. When my family moved here in the early 90's one of the neighbors told us that a random Joe Schmo started building his home in the area but when developers came in and bought the land they made him tear it down and leave. You can tell the materials and design are too modern for the mining days.. I wish someone knew something about it though!! In the 1980's there was a considerable amount of debris still on the site which was "cleaned up" by someone. The pile was mostly wood with what appeared to be fire damage containing a board with a name written on it, which, unforntunately, I can not remember. At the time I was hiking there, the only access was from the north side of the mountain and the trail was badly over grown and difficult to follow. The wash below the ruin may stil hold some clues. If you follow the ravine to the right of that chimney there was a huge mine shaft on the west side of it. Me and my pops rode our dirtbikes out there from mountain park ranch in 88 or so and went through the mine. There was still tons of stuff in it. There was a name on it I don't remember what it was, max delta is on the other side. There's new houses in front of this spot now in 2013. Could it have been Maria Piedritas ranch? Story being told she was known in Phoenix at the markets for paying in little gold nuggets. Who really knows. Was just out there today. I found a kc baking powder lid. Says 10 cts. Early 1900's? The one mine on top of the mountain there needs to be filled. It goes straight down 20-30 plus feet. I love stomping around that whole area. Wonder if those monstrous washes have any nugges in them.